Many unique hardscape styles, patterns, and colors are available to add style, functionality, and value to your home. 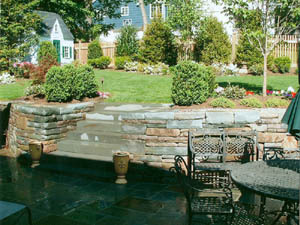 A selection of hardscape materials are available including blue stone, brick, river rock, paver stone, limestone, etc. We will help you select what best complements your home and will customize walkways, patios, retaining walls, etc. to your satisfaction. One of the leading causes for water in a basement is improper grading. An assessment of the grading around the foundation of your home will be taken to ensure that all water is diverted away from the structure. All underground drainpipes will be checked to ensure that they are in tact and clean. Replacement drainpipes will be recommended only if necessary. 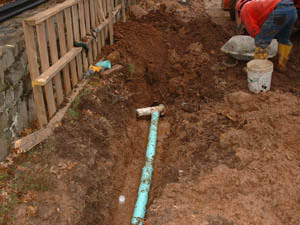 Other critical drainage issues that we address are sump pump connections to ensure proper discharge at street curbs and proper connections to gutter downspouts to divert water to flow away from the home. We install new driveways using high quality asphalt material. Many options are available for decorative aprons and curbing. From inception to completion we address such issues as electrical, plumbing, drainage, waterproofing, etc. as it relates to your landscaping project. We are a "one stop shop". We use only quality materials for all of our installations and are fully insured. 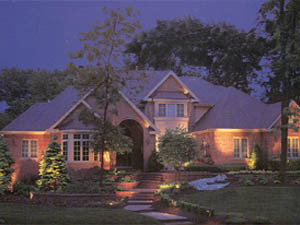 There is nothing like the allure, curb appeal and elegant beauty of low voltage outdoor lighting. Let us create an outdoor evening wonderland for you by meticulously placing lights to highlight and enhance the unique features of your landscape. In addition, to the ambience of low voltage outdoor lighting, its illumination adds security for residents and visitors to navigate around the property safely. Our skilled professionals will strategically place and install your choice of lighting fixtures throughout your property. We also install fire pits, built in bbq's, arbors, fences, and many other landscape structures. For the kids, we install play areas such as RR Tie borders with play chip mulch. We are a "one stop shop". From inception to completion we address such issues as electrical, plumbing, drainage, waterproofing, etc. as it relates to your landscaping project. Contact us for a complimentary estimate, or call us at (973) 763-6566. Please visit our photo gallery for a wide selection of landscaping ideas and design options.